I have finally finished my sweet cradle. Oh! it is just so cute, that the girls and I can't wait until Dad makes us a *few* for our own dolls. I wanted to make a bedding set that wasn't too fussy and too full of detail, as to not take away from the beauty of the wooden cradle. So I opted for contour-quilting a pretty linen print of air balloons, clouds and birds. I have always loved this print, which I used to make sweet Pili a set of overalls, back in the day, and that was waiting for something extra special to use up the last bit. 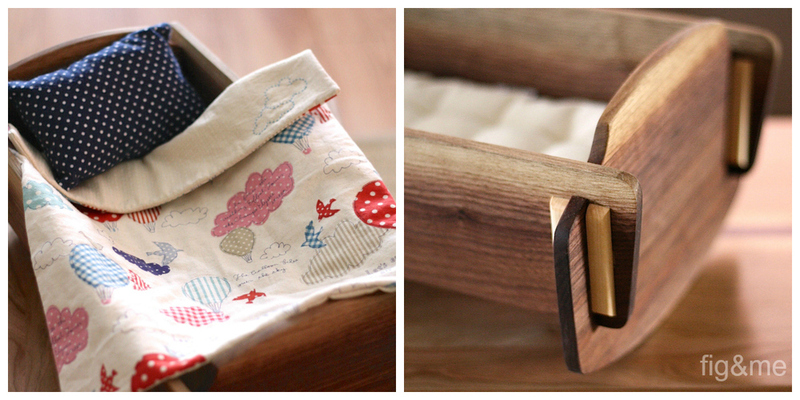 What better occasion than to make a little comfy blanket for this cradle?. 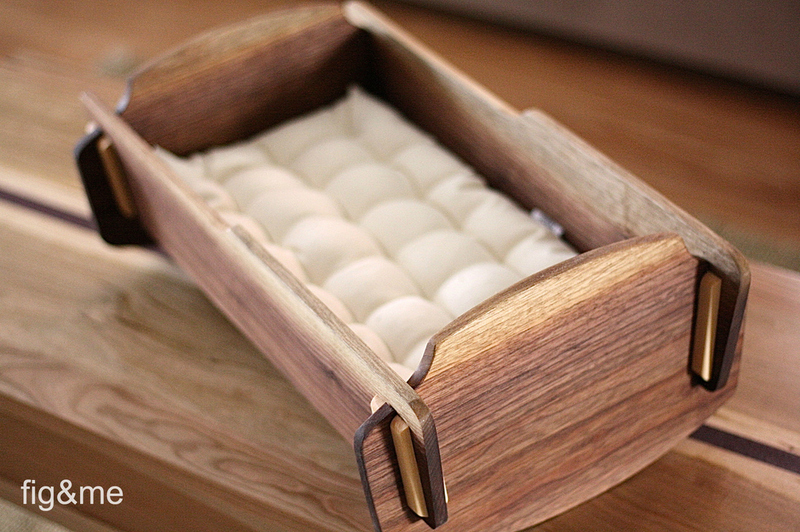 o this little walnut & maple cradle (made by my talented husband), along with its hand-tufted canvas mattress (stuffed with wholesome wool), linen/cotton quilt with a few hand-embroidery details and pretty plush cotton flannel pillow (also stuffed with wool), will be available for purchase tomorrow night in my Shoppe Sunday March 3 at 10 PM EST (sorry for all the night time selling, but it is best to do this when the little ones are in bed). The cradle is meant for my 13" dolls, they fit quite cozy in there, but it will fit any doll up to 13" tall (the cradle is of course larger, but there is room for the doll to fit snuggly inside). This cradle doesn't ship flat, so there is no assembly to be done at home. Once the woodworker gets a bit more time in his workshop he will make more with this feature, as to reduce shipping charges. Now I must get back to my sewing extravaganza. I am sewing wee bunnies, easter treats and a doll or two. 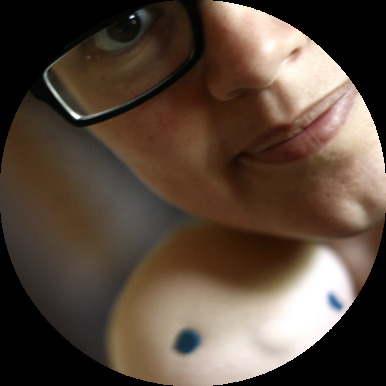 The month of March will have no custom work done, so everything will be available for purchase either here on the blog (via comment-style) or through my Etsy store. o not miss a beat, please add my blog to your bloglovin or google reader ( this would be the address: http://www.figandme.com/blog ). I promise to work this month on the sign up button!. We will wait to see which little doll gets to sleep in this beautiful set. Feb 26 Miss Crocus and Miss Candy. Oct 13 Woodland doll ears for everybody…and some new wands. Feb 23 Rowan, a handmade cloth doll.